The main sentiment of this piece was written shortly after the Tottenham game, but due to a planned holiday and inability of taking my laptop allied to me sending the article to the wrong place it never made the cut. Not to worry, the extra time allowed me to reflect on my thoughts for a longer period of time, which went from fury, to a tonic of optimism and deflection followed by some relief in the games that have followed. The start to the season has been poor. While the fixture list has been particularly unkind we have been a long way where we would like to be in each of our last 3 league games. Difficulty of fixtures is should not just give any a free pass, particularly when we are seeing sides such as Burnley cause problems to the top teams. While I have argued that this season will be transitional in nature there needs to be a clear understanding that dropping below 7th shouldn’t be something we should be contemplating even after an underwhelming start. The basis for this sentiment seems to be based on two different points, firstly that Moyes and Martinez had a difficult second season and were given time to rebuild the squad and secondly Everton are trying to recover from losing their talisman Lukaku. Moyes and Martinez had a difficult second season at Everton and were given time to rebuild the squad. Both of the above arguments are true. However we do have to look at the state of the respective squads that both managers took over which indicate that Koeman ought not to have as much leniency as they had. Moyes was left with an ageing squad that had suffered from years of under investment. Messrs Gascoigne, Ferguson, Campbell, Weir, Stubbs and Ginola were backed up by the likes of Carsley, Unsworth, Pembridge and Gemmill as the first team players. There are some top pro’s in there but all were coming towards the end of their career. 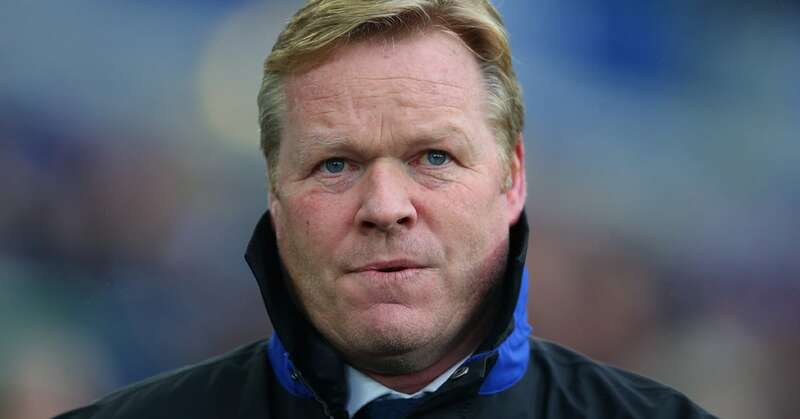 In his first season he guided Everton to their first top half finish in 6 years. He had earned the right to a disappointing second season and paid back that trust with a consistency of performance that saw us only drop below 8th once in the next 9 years (to 11th place). 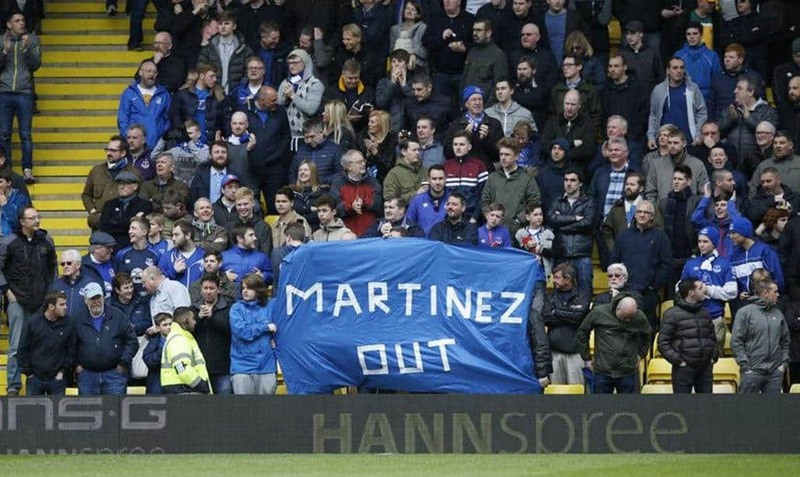 With Martinez he had the unenviable job of following a manager who had established a way for the club to punch above it’s weight. Again a number of the players at the club were approaching the wrong side of 30 (Baines, Jagielka, Distin, Howard & Osman) he was still being able to guide Everton to a record points total of 72 points in his first season and earning him the right of a disappointing second season. He was sacked for finishing 11th and getting to two domestic cup semi-finals, which is effectively setting the bar for what is to be considered unacceptable performance. In the eyes of consistency of the fanbase Koeman would be well advised falling towards those stats. While it was a good first season for Koeman you would be hard pushed to say it was so good that he gets a free hit this season in the way Moyes and Martinez had earned a 3rd season. Perhaps what is more complex to the Koeman situation is that he now has under 2 years on his deal which generally signifies a period where club and manager consider their longer term plans. At present for both Koeman and the club it is fair to say all options remain firmly on the table, with legitimate grievances on both side allied to positives both have experienced. The point about the loss of Lukaku is also a fair one, replacing 26 goals (25 from open play) with a single player is almost impossible. Yet as with most stats the devil is in the detail. Stats showed Everton would still have finished 7th had Lukaku’s goals been removed. In some quarters this was used as a stick to beat Lukaku with, though I feel it is far better served to indicate to us how much further ahead than we are of our competitors. Even with a replacement coring 0 goals (and currently Rooney has 2) we’d have still not fallen any lower in the league. It’s hard then, when you consider the 150 million pounds worth of investment we have made to justify an outcome where we are able to finish lower in the league as anything other than a disappointing season with mistakes being made in the process. That being said there are some mitigating factors for Koeman. It is my own belief that managers require time. For some years now Everton have been something of a rarity a in the Premier League in upholding an older tradition of allowing it’s manager suitable time to put a squad together before being judged. It used to be managers got 5 years, that soon went down to 3, then 1 year and increasingly now if you have not won by September even clubs such as Crystal Palace may consider pressing the eject button. The immediacy of modern life, exemplified by social media sites such as Twitter has led to a great deal of impatience amongst fan bases. This is of course egged on by the main stream media who talk up “crisis” at clubs after one bad result then look on sneeringly at the supporters who behave in an often crazed and panicked manner as a result of their reporting. An example of this was after Atalanta talk that Koeman had “lost the dressing room” which has been a phrase I only remember entering the popular lexicon over the last 10 years or so. I can’t believe it happened that often before, but it has become something of a self fulfilling prophecy now, with those associated with football seemingly able to whip up a storm to make a manager seem replaceable. Sometimes players or managers can just have a bad game and while it’s not enjoyable to watch it doesn’t automatically mean you are at the beginning of situation where the players have given up. The situation can often be retrieved, with a change of formation or personnel. The United away game indicated to me the players were still trying for Koeman in spite of an unflattering scoreline. Football is at it’s essence a random game, where upwards of 50% of goals are unavoidable and chance plays a big role. In part it is what makes the game the most watched and enjoyed in the world. This was particularly evident with the United game where Valencia smashes one in on the half volley from 20 yards. Yes Everton are too deep but the quality of the strike is cruel on an Everton team who were lacking in confidence. The collapse in the final 10 minutes, having made 2 or 3 good chances to equalize gave the game a final look of a hammering which doesn’t reflect the majority of the match. Having gone behind so early to have stayed in the game so long was a very commendable effort and demonstrates to me the players still want to give their best for him. Perhaps Koeman’s biggest problem on the horizon is not Everton’s own form but rather two potential managers that are currently available for Everton if he were to leave, namely Thomas Tuchel and David Unsworth. Where Koeman seems an uneasy fit into what Everton are trying to do with the development of younger players both of the above would fit easily into this approach. Tuchel has extensive experience of youth football in Germany, had a terrific record at Mainz before inheriting the mess Klopp left Dortmund in. He led them to a 3rd and 2nd place finish as well as winning a domestic cup (against a Bayern side that were far more dominant than Klopps Dortmund faced). From the outside it looks as if Dortmund are a similar model to what Everton are trying to emulate and while there may be questions about whether Tuchel is a better manager than Koeman, whether he would be interested in coming, or whether his managerial skills could be translated to England there can be little doubt he would be a natural fit for what the club is trying to do. As for Unsworth every year he continues to impress. He has produced and developed a number of young players for first team football, most notably Davies, Calvert Lewin and Holgate. At the same time he has also transformed Everton’s under 23’s from one which played some of the youngest players and produced good performance but generally finished towards the bottom of the league to one that would dominate the league to win it. This season he’s lost 7 of the key members of that team (to loan or promotion) but yet the replacements seem to be settling in perfectly as again they win games. The simplicity and humility that comes from Unsworth again seems like he would be an easy fit for the first team job. Everton made a historic investment in youth in the summer with 11 players aged under 22. Not all will make it to the first team squad, but you can see a clear intent with this. At times Koeman’s words seems confusing and contradictory to this approach. His desire to have more experienced Premier League players seems to jar with this and I do find some of the comments on younger players confusing. Even before the United game he spoke of how the under 23’s is not a good indicator of whether a player is ready, and named Kenny and Davies as examples of two players who were still some way off in terms of performance. Yet Davies started at Old Trafford and acquitted himself very well. He didn’t look out of his depth and looked every bit as good as the United players he was up against. I am unsure what Koeman was trying to achieve with the comments. Perhaps this is his way of trying to improve the standards of the young players at the club but if I were Kenny or Davies I would be looking at the performances of Martina, Schneiderlin, Gueye and Klaassen and wondering if the same scrutiny might be better applied towards more senior players. In spite of this there were many positives to be taken out of the United performance, irrespective of the scoreline. Schneiderlin looked back to his best and formed a fruitful partnership with Gueye, Martina to his credit put a number of intelligent balls into the danger zone, and though Rooney was perhaps guilty of at times being too clever I felt he led the line with a maturity commensurate with his age. 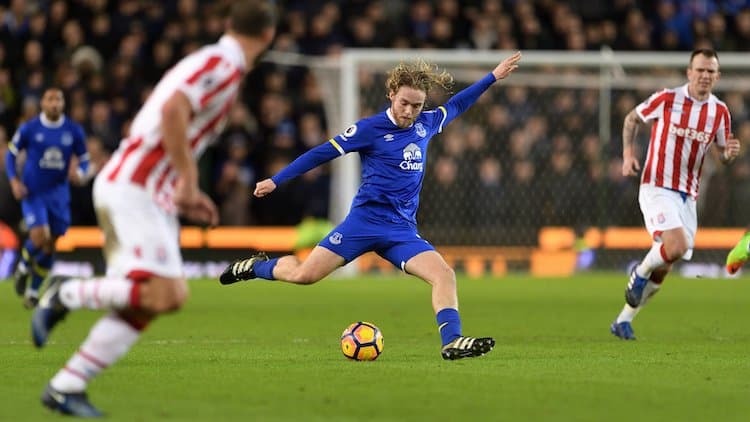 The biggest plus as indicated above was the performance of Davies who seems to play with a maturity and simplicity reminiscent of a young Cesc Fabregas who would dictate the pace of the game. The positives outlined above can be added to with a decent win at home to Sunderland. We fielded an outfield 10 with an average age of 22.5 years and with the inclusion of Ademola Lookman we had 6 lads aged 20 or under. Perhaps to contrast what I have said above, the most pressing question for any Everton manager is how far he shows he is adept at continuing the development of the younger players we mention. Koeman becomes fiendishly difficult to evaluate as his outward words often don’t match the concrete behavior in including them. I sense this side should improve as the season goes on and they become more familiar with one another. You sense the likes of Vlasic, Calvert Lewin, Holgate, Lookman and Kenny may well be pushing for a first team place in the way Davies is by the turn of the new year, that should be the aspiration for the players themselves and the coaching staff. With a number of lads such as Klaassen and Sandro aclimatising to the league I sense we will only see the best from them in 2018. The big challenge is to maintain a respectability in performance in the league and where possible keep ourselves in the cup competitions. Chelsea away is a formidable draw though we are capable of beating what will likely be a heavily weakened Chelsea side. Over the coming league games we have 2 homes games and a trip to Brighton against 3 sides who currently look like they will be in the bottom half of the league. While none of these games are easy we really need to be targeting 2 wins from these fixtures. Anything less than that and I sense the pressure on Koeman will begin to mount. What will be critical over the forthcoming games, is a continuation of the goals we saw against Sunderland- Klaassen, Davies, Mirallas and Sandro need to open their accounts for the season while we need Rooney and Sigurdsson to start continue scoring. This would be my key message to all of our attacking players if I were Koeman, in the absence of we need more players to chip in. As for myself, I can see both sides of the Koeman debate and everything in between. I would urge fans to consider that there is a significant space between feeling a manager could do better or even thinking a manager is underperforming and wanting a manager to be sacked. Often those things are conflated as one and the same when football fan discuss managers. Often I am disappointed in a manager, team, performance or sequence of results however you cannot sack managers every time you are concerned with a series of results. While I’m concerned at the results thus far, you can see green shoots of recovery with the Manchester United performance and Sunderland result. While finishing below 7th shouldn’t be countenanced at this stage as an acceptable performance, if it can be seen within the context of Koeman developing a distinctive style, integrating younger players and finishing in a manner that can give us optimism for the following season then this will provide some grounds for optimism. If there are two things that I will be looking for to commit to Koeman being the man to lead Everton long term, they will be that he is capable of developing the plethora of younger players we have, and that we can begin working to a playing style that isn’t dependent upon Lukaku to bale us out. This can and should start over the forthcoming games.